Residentail Life opened a new package center in Kemper Hall. The package center will service all North Campus residents as a means of supplementing the Foster-Walker Complex center. 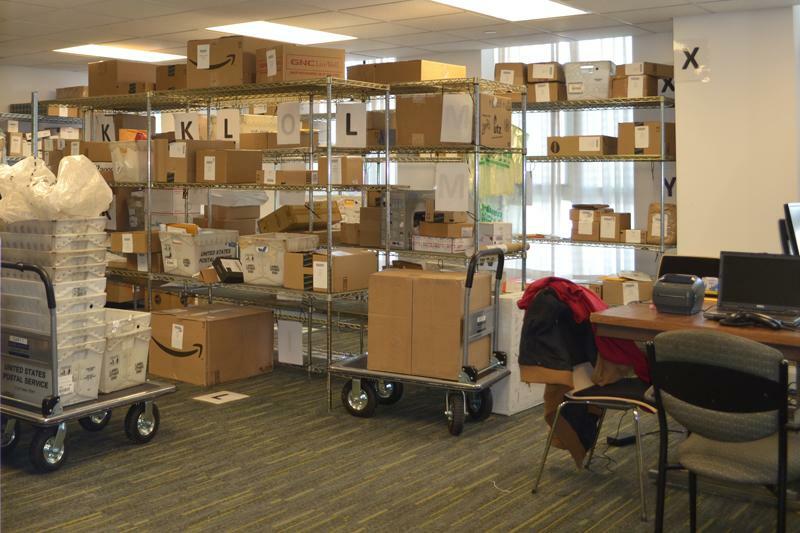 Kemper Hall became the second package facility on campus Monday, following student complaints about the location and wait times at the Foster-Walker Complex mailroom. Students who live north of Noyes Street — in effect, Sargent Hall and the buildings north of it — will have their packages sent to Kemper. Ayers College of Commerce and Industry and Slivka Residential College were also considered for the satellite location. “We have a neighborhood desk (at Kemper Hall) now that’s 24 hours, so that made some sense,” Riel said. The mailroom, which is much smaller than the one at Foster-Walker, is located on the first floor of Kemper, directly across from the neighborhood desk. According to Riel, a satellite facility for the main mailroom was always a consideration. Students who live on North Campus said they liked the change because of its convenience. Residential Services first presented the idea of a second location Nov. 6 at a Slivka Residential College forum. “We were hearing from students that that was something that they would like to see and it was something that we thought that we could work out,” Riel said. The opening of the mailroom was announced Dec. 2 in an email to the Northwestern community. The new facility could also help alleviate traffic at Foster-Walker. “If there’s fewer people going there, it’ll probably help wait times,” Weinberg freshman Grant Klein said. Last year, the package system was based out of six locations — including Kemper — and proved unreliable. Because packages get logged at Foster-Walker when they first arrive, the addition of a second location still keeps the current, centralized model intact. If a package arrives on a weekend, it will be checked in and stay at Foster-Walker until it is taken to Kemper on Monday morning. If a student wants the package over the weekend, they can pick it up at the primary mailroom. All packages addressed to North Campus residents that were in Foster-Walker over Winter Break were transported to Kemper. The Kemper facility is open from 11 a.m. to 8 p.m. on weekdays and 11 a.m. to 5 p.m. on weekends. The Foster-Walker mailroom has longer hours on weekdays, opening at 8:30 a.m.